Over the past holiday week, it’s been chilly here in San Diego and the cool weather made me long for a hardy winter dish. 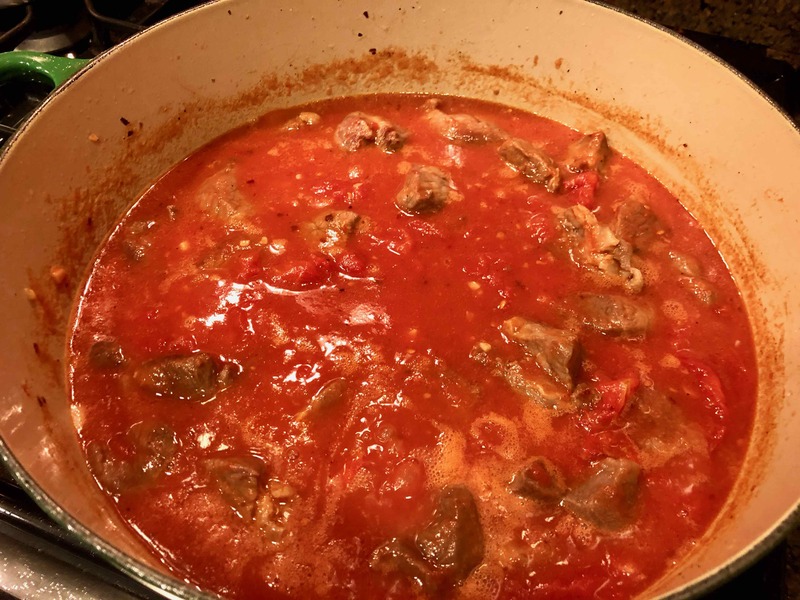 Looking through my cookbooks, I came upon a recipe from Lidia Bastianich’s Lidia Cooks from the Heart of Italy for a pork ragù with farro Potenza style. 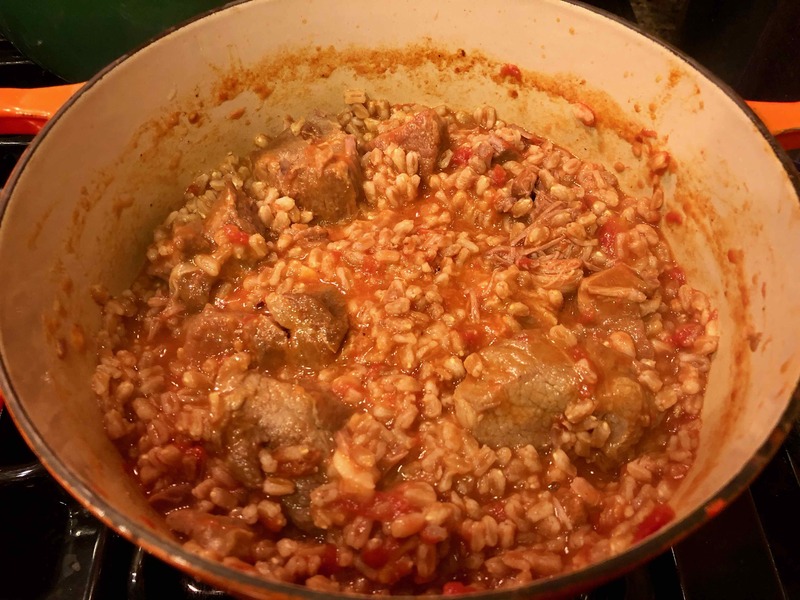 The combination of pork shoulder simmered low and slow in a spicy tomato sauce and then combined with nutty farro sounded most appealing. Fortunately, our local grocery store was having a great half-price sale on fresh bone-in pork shoulder roasts, which added even more appeal to the recipe. Even though I only needed two pounds of meat, I picked up a six-pound roast that would allow me to practice my butchering skills and provide me enough meat for a couple of meals. Later that afternoon as I was cubing the meat, my husband came into the kitchen and asked what we were going to have for dinner. When I told him and described the dish, he asked: “Didn’t you write about that already?” Well, sure enough, he was right. I had published a post in September of 2015. What to do? My heart was set on the dish, so I decided to make and write it up once again. 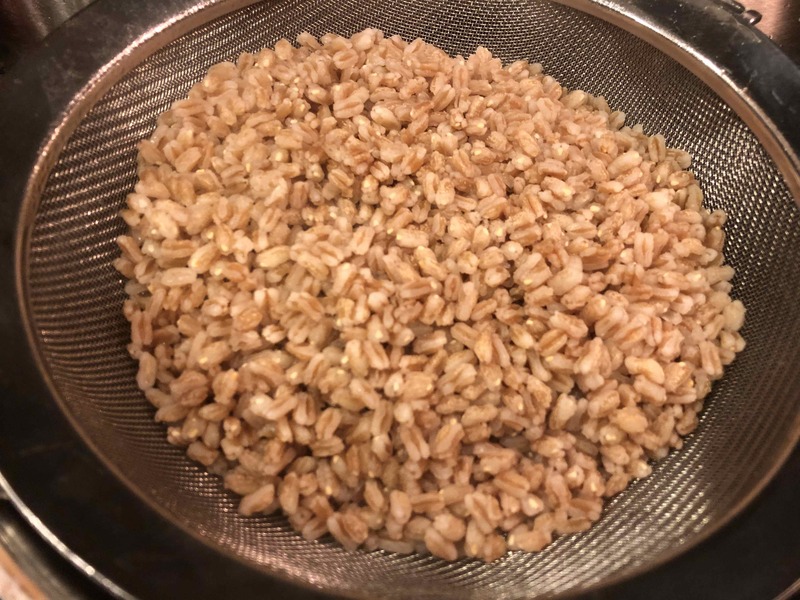 As I did three years ago, because I was cooking just for two, I prepared only 8 ounces of the farro and combined it with half of the ragù. And as it did the last time, my pork required at least another 30 minutes of cooking before it became perfectly tender. To achieve maximum flavor, be sure to pat the meat dry with paper towels and then brown it well. Don’t rush this step. 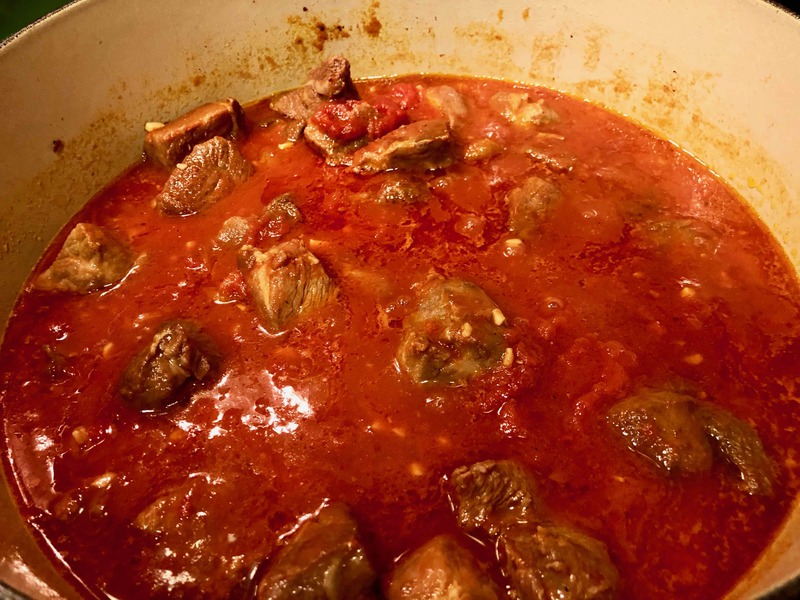 Also make sure to scrape up any brown bits sticking to the bottom of the pan after adding the wine and again after adding the tomatoes. Finally, If you like spice as I do, you may also want to increase the amount of peperoncino flakes. 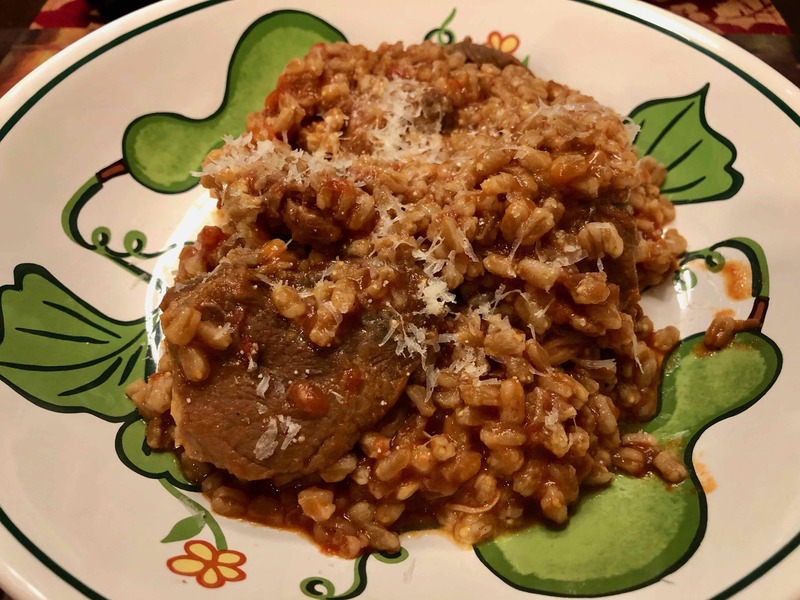 This is the quintessential cold-weather dish, with juicy cubes of pork nestled in mounds of richly sauced nutty farro, that’s even better when paired with a southern-Italian red like an Aglianico or a Primitivo. A dry Zinfandel might also be a good match. Recommended equipment: A heavy saucepan, such as an enameled cast-iron French oven, 5-quart capacity, with a cover; a heavy 3- or 4-quart saucepan. 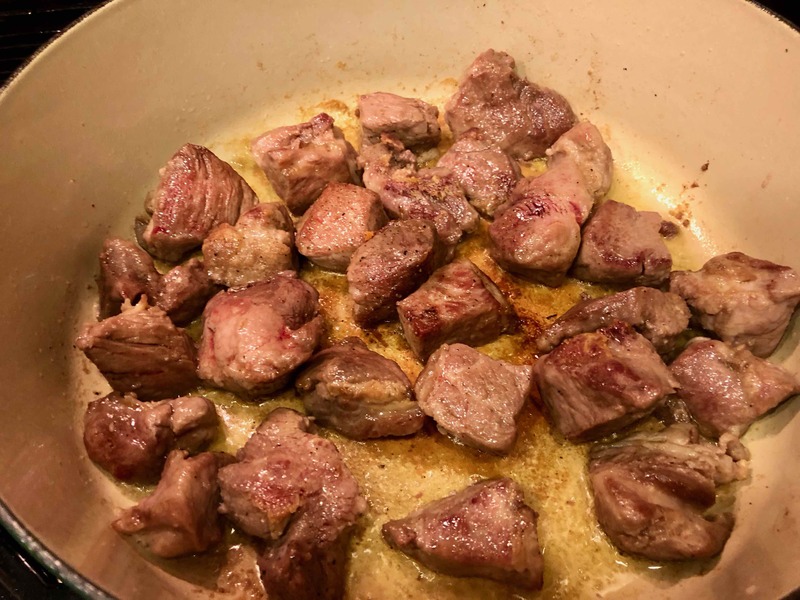 For the ragù: Trim the fat from the exterior of the pork. Cut it into bite-sized morsels, about 3/4-inch cubes, trimming more fat and bits of cartilage as you divide the meat. Pat the pieces dry with paper towels. 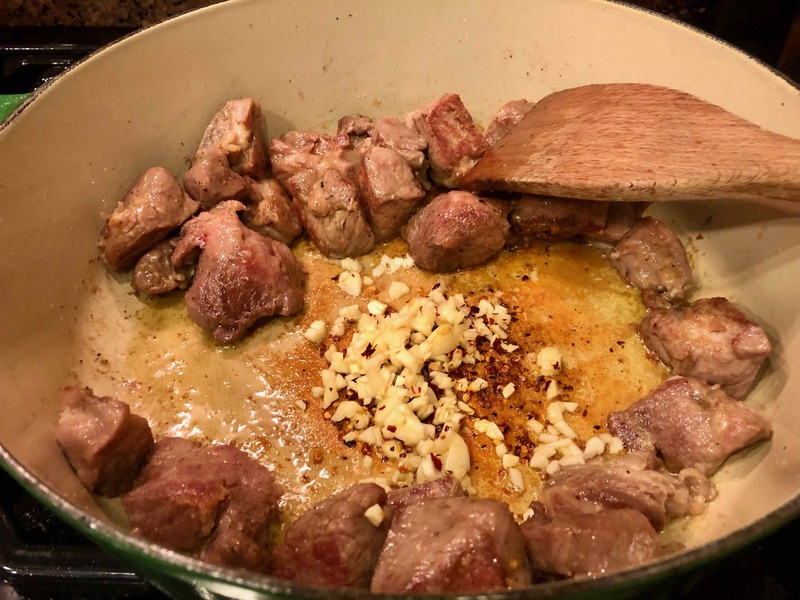 When the pan is dry and the pork starts to sizzle and crackle, clear a hot spot on the bottom and drop in the chopped garlic and peperoncino. 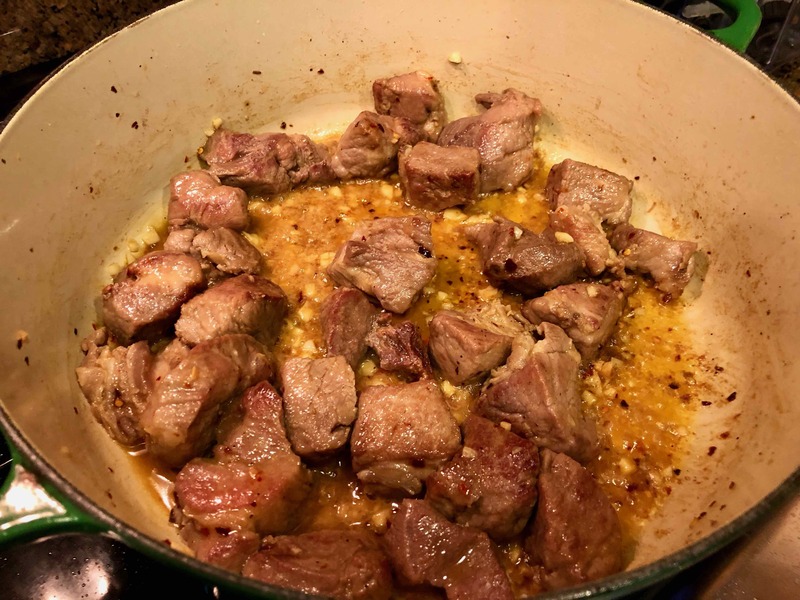 Stir and toast them for a minute or so in the hot spot until the garlic is fragrant and sizzling, then stir and toss with the meat cubes. Raise the heat a bit, pour in the white wine, stir and bring to a boil. Let the wine bubble until it is nearly evaporated and the pork is sizzling again. Pour in the crushed tomatoes and a cup of water that has been sloshed around to rinse out the tomato can, grate on the fresh nutmeg and stir. 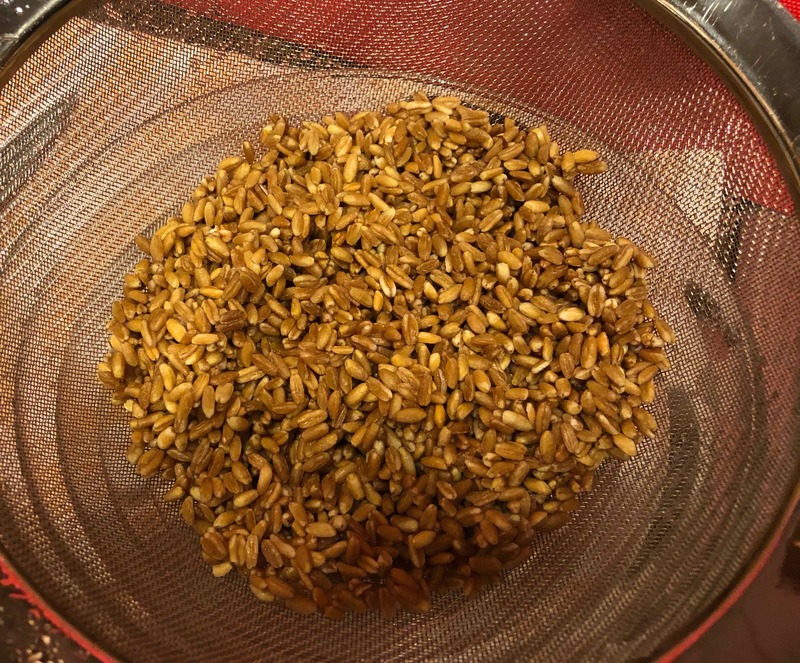 Meanwhile, prepare the farro, first rinsing it well and draining it in a sieve. 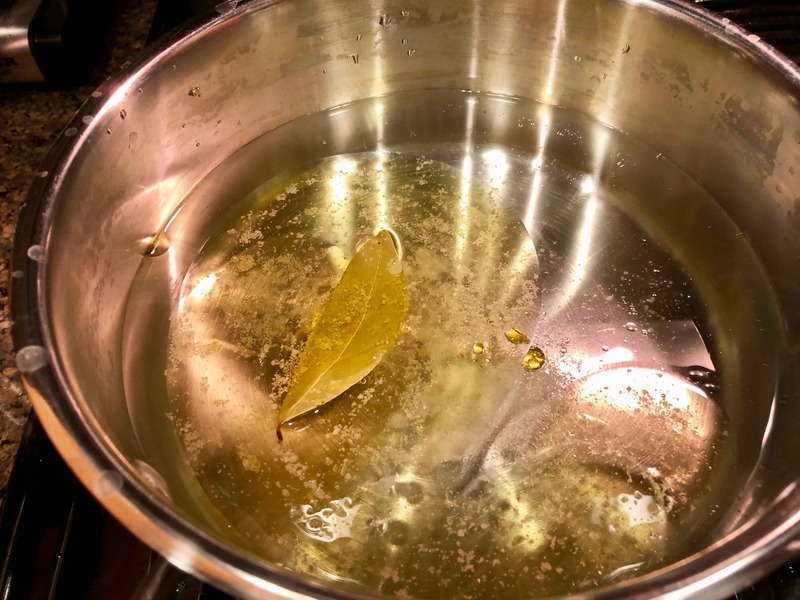 Put it in the smaller saucepan with 6 cups cold water, the bay leaf, salt and olive oil. Bring to a boil, stirring occasionally, then set the cover ajar and adjust the heat to maintain a steady simmer. Cook about 30 minutes, stirring occasionally until the grains are cooked through but still al dente. 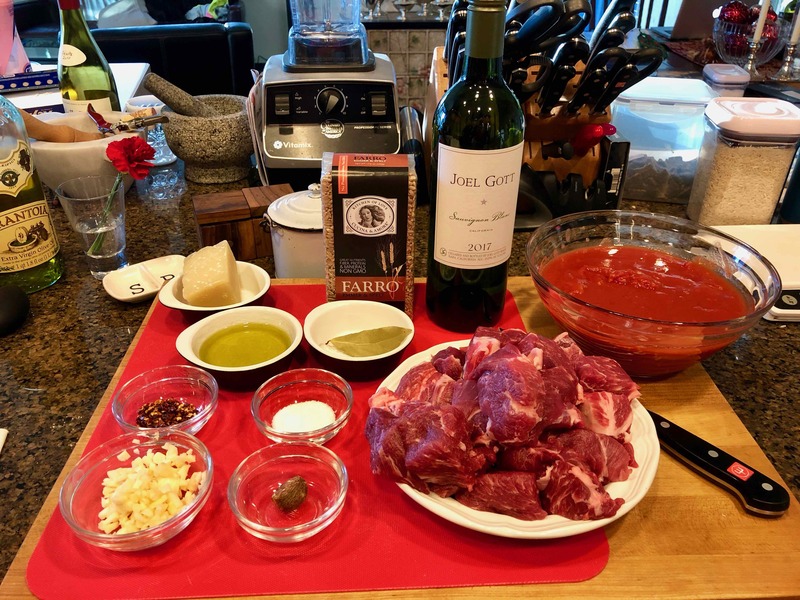 Turn off the heat, pour off excess liquid and keep the farro warm until the ragù is done. To finish the dish: Have the ragù simmering and stir in the farro thoroughly. Cook together for a minute, so the grain is very hot. Turn off the heat, sprinkle the grated cheese on top and stir in. Spoon the dressed farro into warm bowls, and serve immediately with more grated cheese at the table.